With their roots submerged in the thick buttery mud of traditional bluegrass, The Lil Smokies have sonically blossomed into a leading player in the progressive acoustic sphere, creating a new and wholly unique, melody driven sound of their own. The quintet, from Missoula, MT, has been hard at work, writing, touring and playing to an ever-growing fan base for the past 6 years. 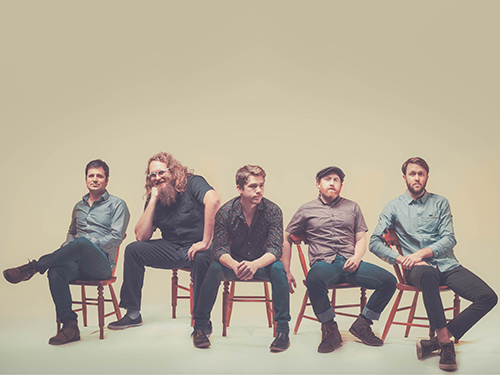 The fruits of their labor recently culminating with wins at the 2016 International Bluegrass Music Association (IBMA) Momentum Award for Best Band and at the 2015 Telluride Bluegrass festival band competition. In 2013 the band also won The Northwest String Summit Band Competition. With a unique blend of traditional bluegrass, newgrass, innumerable unique originals, sheer raw energy, and exquisite musicianship, The Lil’ Smokies weave seamlessly through genres, leaving behind melodies you’ll be singing to yourself for days and a jaw you’ll have to pick up off the floor. The Lil Smokies have no problem captivating large audiences. Sharing the stage with heavyweights like Steve Martin and the Steep Canyon Rangers, The Nitty Gritty Dirt Band, Keller Williams, Greensky Bluegrass, The Emmit-Nershi Band, Yonder Mountain String Band, The Travellin’ McCourys, Sam Bush Band, Fruition, Infamous Stringdusters, Bradford Lee Folk and The Bluegrass Playboys, and dozens of others. The Lil’ Smokies have become festival favorites coast to coast with highlights including Delfest (MD), Pagosa Folk N’ Bluegrass (CO), ROMP Fest (KY), Hangtown Halloween (CA), Telluride Bluegrass Festival (CO), The Summer Music Festival at Roseberry (ID), Northwest String Summit (OR), Targhee Bluegrass Festival (WY), River City Roots (MT) and more! This five-piece bluegrass ensemble features Andy Dunnigan (dobro), Scott Parker (upright bass), Matt Cornette (banjo), Jake Simpson (fiddle) and Matt Rieger (guitar).